In the absence of letters and other kinds of records by Eliza and her children, we have to rely upon the kind of information that would have been widely available at the time that our Cartwright ancestors were alive. I have located a couple of resources from the period between 1859 and 1874 that were known to be used by immigrants as they made their way to Arkansas and beyond. There is no guarantee that Eliza or her son Thomas ever read these materials, but these books are both popular enough in that era that they provide stable indications of what it is possible that they might have known. The Prairie Traveler (1859) was written by a U. S. Army captain who had been put in charge of the army’s project of establishing viable routes west. 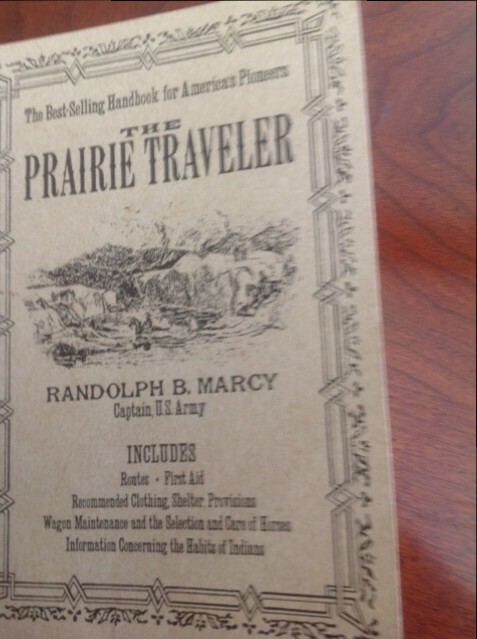 The replica copy of this little volume by R. B. Marcy that I purchased some years ago was advertised as “The best-selling handbook for America’s pioneers.” Some of the information, although practical in scope, is not likely to have been enlightening to Eliza and her family. I think, for example, of the chapter about wagons. It is hard to imagine someone on the side of the road reading The Prairie Traveler and trying to figure out how to deal with a broken wagon wheel. On the other hand, this volume does have the verbal equivalent of maps that would have helped Eliza and her family figure out how far west they might want to venture. Here we have to remind ourselves that just as today interstates make some areas of the country more accessible than others, so also in the 19th century, the roads west from Fort Smith would have been more well-known than the roads in Arkansas itself. And we also need to remember that Oklahoma was the 48th state admitted to the USA. This area was sparsely settled then, and the population of most sections of Scott County is even less today than it was in the early part of the 20th century. In sum: the area between Scott County and the Oklahoma border would have continued to have been frontier-like long after most other sections of the US would have been settled. So Eliza would have had information about how to get to Scott County, that her land was in a mountainous area, and that there were a couple of different ways to get there. We don’t know if she arrived on the road from Fort Smith or on the road that wound its way West from Dardanelle (where she purchased the homestead claim). Here is the entry for “Scott County” (found on p. 83). “Lies south of Sebastian and Sarber [later renamed Logan] west of Polk and east of Indian Territory. Waldron is the county seat, a small town of two hundred souls. Surface broken and rolling. Soil produces cotton, corn, small grain and fruit. Timber, a fair supply of the usual varieties. Population, 7, 483; in 1860 was 5,145.” (83) Because the information available for Sebastian County in this immigrant’s guidebook is much more extensive (perhaps because folks in Fort Smith paid to have a more extensive entry perhaps? ), the information about Sebastian County may also have influenced the family’s choice. For example, the section on minerals advertised the fact that “The coal fields of Sebastian County are thicker and more extensive than any in the State. . .” and the likelihood that the availability of this mineral resource would enhance “the future prospects of Sebastian County, especially in the location of lines of railroads in the valley of the Arkansas River.” (86). If Eliza and her children read some portions of this book while they were trying to scratch out a living on top of Peanut Mountain at Shiloh, one wonders what they would have been of Burnell’s dedication, “To the THOUSANDS OF IMMIGRANTS whose signet of nobility is a stout heart and a willing hand. . .” Although this probably is the best source of information to look to for what it was possible to know about Arkansas at the time that Eliza and her family were establishing their homestead, I concede that it is unlikely that this kind of resource was their principle source of information. “Word of mouth” is the more likely practical source of information. We know that quite a few families from Carroll County, Georgia immigrated to the same area within a few months or years of one another. So it may be that what Eliza and her children knew was what they heard from neighbors who made their way to Western Arkansas shortly before they did. These would be some of the ways in which Arkansas as “the land of opportunity” would have been interpreted to them before they arrived in 1872. Based on the information I have been able to access, it appears unlikely that Eliza would have had much information about the actual topography of the land that she homesteaded. The land that was available for her to buy was not one of the choice pieces of property in the area. It would simply have been what was available to them at the time based on the sections that had been up for sale after the most recent federal survey. The best property had already been acquired by other parties (including corrupt government officials in Arkansas) just as had been the case in Georgia when her parent (English immigrants) attempted to acquire land through the land lottery in the wake of the defeat of the Creek Indians. Like many immigrants before and after their trek from Georgia to Arkansas, Eliza and Thomas did not know what they did not know when they signed the paperwork staking their claim for a homestead at Shiloh. This entry was posted in from East to West, Questions of the Week and tagged Arkansas: The Home for Immigrants, Captain R. H. Marcy, Eliza Hope Dane Cartwright, Henry Burnell, immigrant guidebooks, Oklahoma, Red Oak, Scott County, Sebastian County, The Prairie Traveler. Bookmark the permalink. 2 Responses to What did Eliza and company know about Arkansas before they came? This additional historical material is great, thanks. The other piece of information that I should have included in my post is the fact that by the time Eliza and her children made their way to Shiloh, both the Butterfield Overland Mail Route and the Pony Express would have gone in and out of business. Fort Smith and Van Buren were important stops on these routes for transportation of mail. Once the railroad began making regular trips east and west through Arkansas, communications between Georgia and Arkansas became more routine.